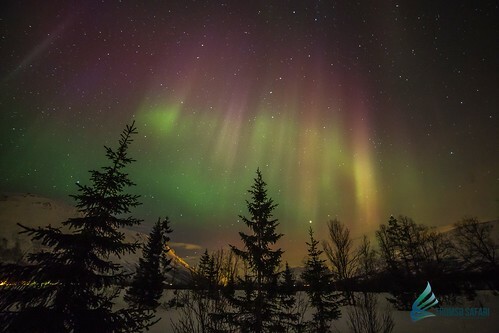 "The Aurora is an incredible light show caused by collisions between electrically charged particles released from the sun that enter the earth’s atmosphere and collide with gases such as oxygen and nitrogen. The lights are seen around the magnetic poles of the northern and southern hemispheres. 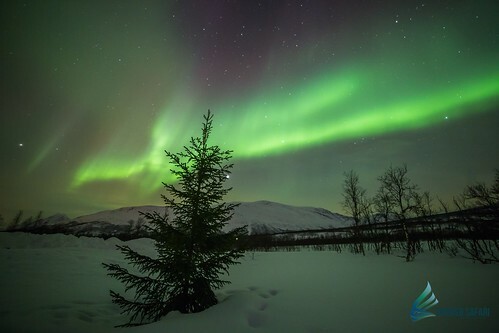 Auroras that occur in the northern hemisphere are called ‘Aurora Borealis’ or ‘northern lights’ and auroras that occur in the southern hempishere are called ‘Aurora Australis’ or ‘southern lights’." 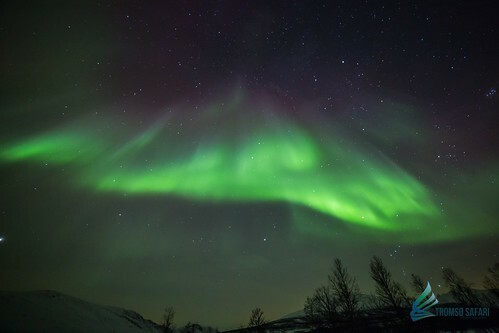 There are abundant information in the internet telling you tonnes and lots of things you need to know about Auroras, where, when, how to see them etc. 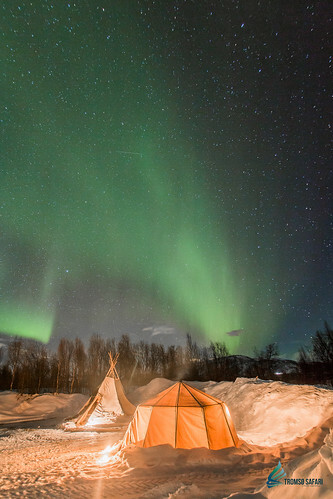 There are many places where you can catch the Auroras, and one of them, is Norway, Tromso. This was where I ventured to. My trip started from Oslo, capital of Norway, to Bergen, then to Tromso. 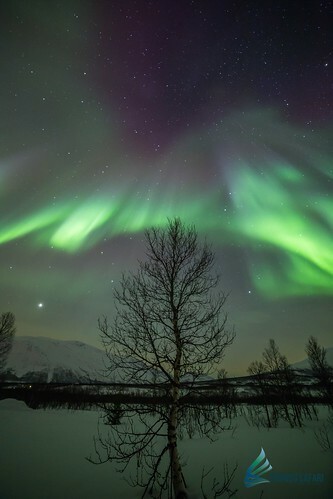 Tromso was one of the cities recommended to catch the Northern Lights. We arrived in Tromso on 4 Mar afternoon. We decided not to catch the lights that evening. 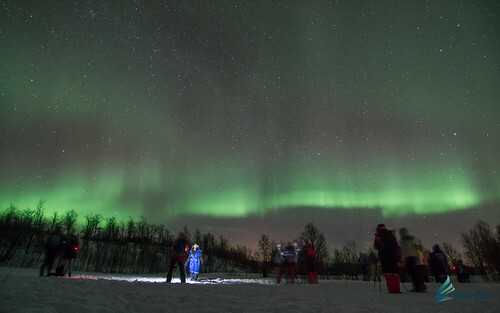 So we booked an Aurora tour the following night, 5 Mar and 6 Mar which was night dog sledding with Aurora. 6 Mar evening was my back-up in case 5 Mar I couldn't catch the lights. And so, we were really excited and all geared up to stay out in the cold for a couple of hours, just so we can catch the lights. 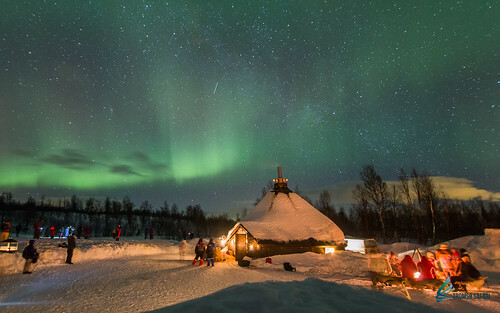 I booked the tour from Tromso Safari, which has base camps with toilet facilities. Each one of us paid Nok950 (S$160) for approximately seven hours including transfers which took 1.5hr each way. When we arrived at Takvatnet base camp, it was all dark with slopes and trees and all snow around us. Upon alighting from the coach, I looked to the sky and immediately, I saw the lights! It was only 8.15pm at that time. Feeling all so excited already, I was so ready to take out my camera to capture the beauty. When all alighted from the coach, we had to walk up a slope, about 200m, to the base camp. In the camp, there were two lavvu and some camp fire set up (refer to pictures below). My hubby and I quickly grab the warm suit to put on so as to keep ourselves warm, despite already having four layers of clothes on us. The temperature was -3C at that moment. Then, we proceed to set up our camera, so eager and excited. Only to find that my camera did not have the required ISO setting! Sad and disappointed that I cannot capture the moment, we made do with just visually enjoying the lights. Many of them were already setting up their tripod to capture the moments. 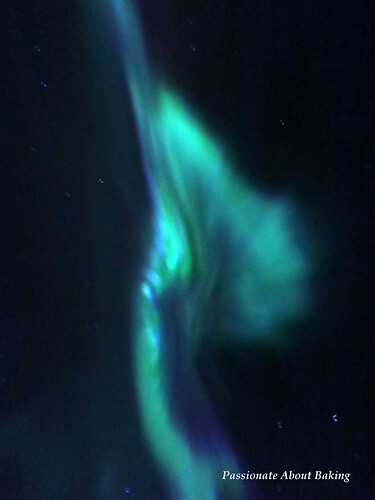 You know how these auroras are...they are very "temperamental", and they can disappear anytime!! That evening, the lights seemed to be enjoying the atmosphere, it was forming various shapes, design and moving quite a lot across the horizon. They were not high, but low. 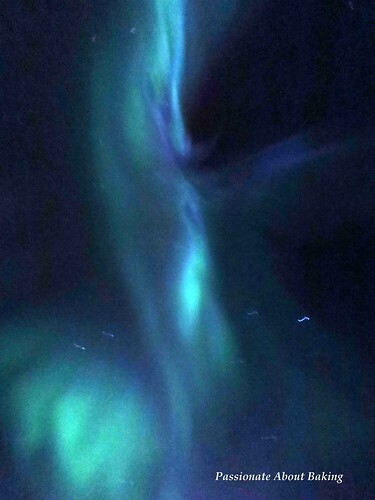 The guide was starting to help the guests take pictures, we queued up to have our pictures taken with the auroras. 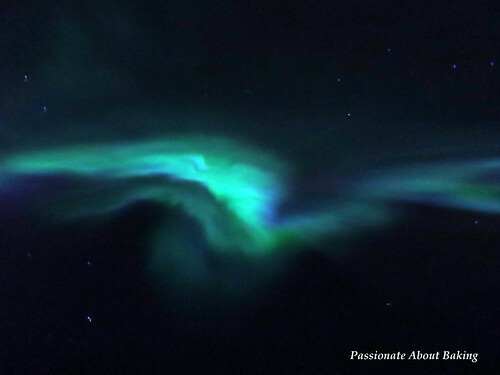 Everyone of us have different aurora patterns. It was very interesting. From the camera, the lights were really pretty. 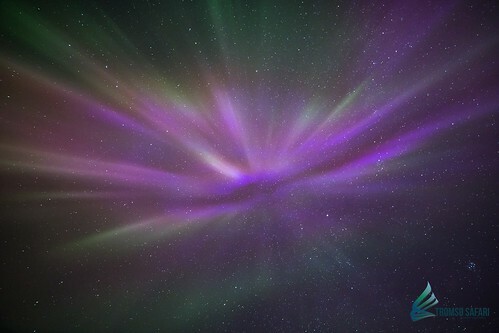 We had to stand still for 20secs in order for the camera to capture enough lights from the surrounding and the aurora. Because the surrounding area was so dark, we could see thousands of stars in the sky. It was so beautiful! After more than an hour, we decided to seek warmth at the main lavvu. They had prepared Norwegian cakes and hot chocolates for us. So we self-served. Suddenly, one of the tour member came in and shouted something. Then everyone started to rush out. We quickly finished our snack and drink and rushed out to see what it was. 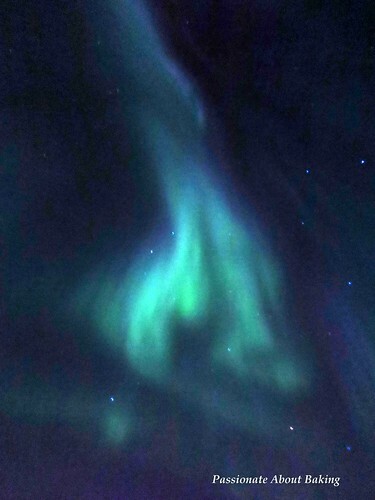 And then, there it was, in the sky, the aurora formed a circle right above us. Some shades were thicker, some were thinner. It was... captivating! Cameras were snapping. And before we knew it, it broke up. Some start to disappear, and others appear at the horizon. It really was an amazing experience. That evening, all who went to catch the auroras, really had an eye feast. You can just sit there and stare at them change form. And we were told the night before, there was no aurora in sight. Some of the guests were repeat customers who couldn't get to see it the night before. All went back happy and tired. By the time we reached Tromso city, it was close to 1am. 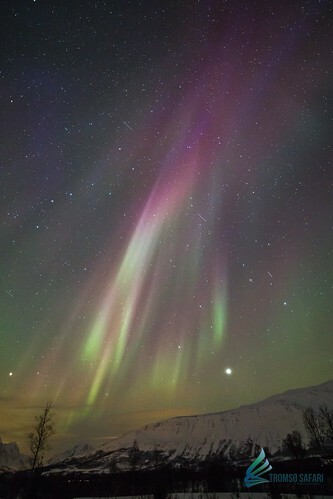 Source: Tromso Safari, dated 5 Mar 2016. Photos taken by our guides. I mentioned I also booked a night dog sledding with aurora right? Now, we were truly truly very fortunate. We get to catch the aurora again the following night, two nights in a row. And I felt this time, it was nicer. As we were sledding, we caught it in the sky at the horizon even at 7.30pm. The dog sled was in Lyngen Alps, where it was pitch dark, except for the reflection of the snow. There was no moonlight. When we stopped for a break, in the middle of nowhere, we saw the lights again. This time, the lights were very high, above our heads. It formed a semi-circle with lines that connect from the horizon to the semi circle above us. It was really nice. Some said the lights can dance, I agree totally. After our sledding, we had some time before going for our late dinner. By that time, it was 8.30pm. We saw more lights. This time, I successfully captured the lights with another camera! Though it wasn't sharp, but the lights can be seen quite clearly. The lights on this day was all high up, and very active and strong. We enjoyed this better as there were less people around us. Photos by me using Canon with 1sec exposure and free hand. I did an auto contrast in the photos. 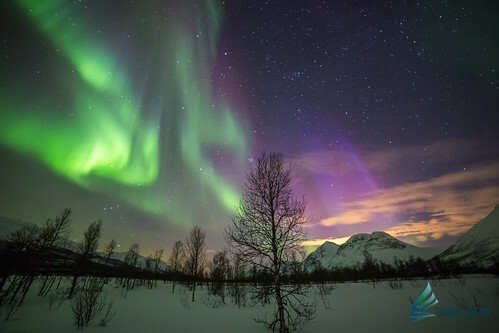 We have seen many photos of how beautiful aurora borealis is. 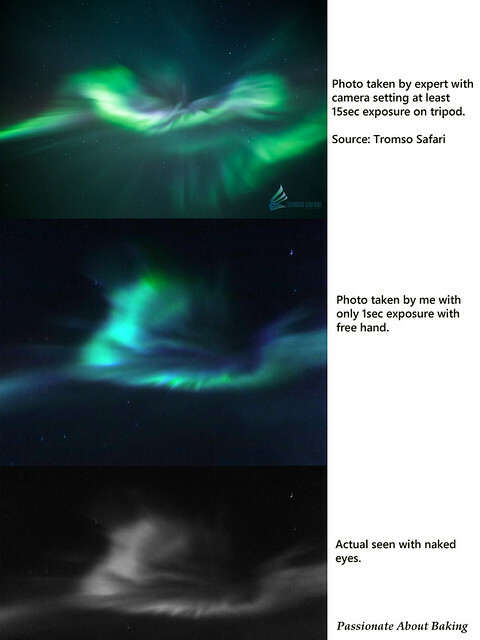 The truth is, those are captured using cameras with at least 10sec exposure with correct setting. Now, with our naked eyes, sorry to disappoint you, we can only see up to greenish lights. The actual lights we see is grey, greyish and greenish. 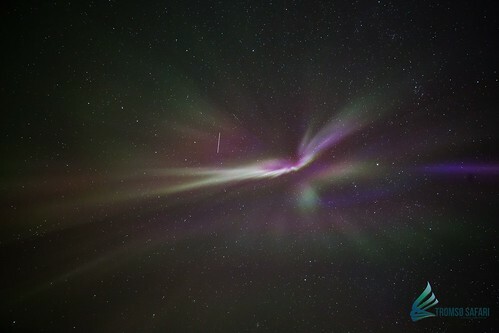 If you were hoping to see those bright beautiful colours and light trailing, then you'll be very disappointed. Because you won't get to see these. 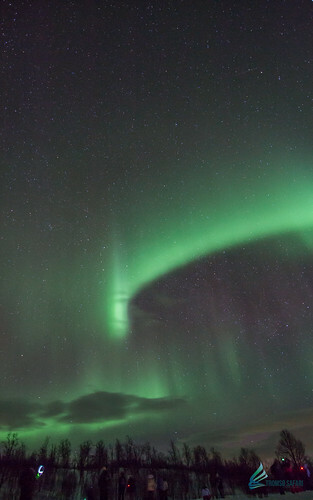 However, I think aurora might be photographers dream to capture. 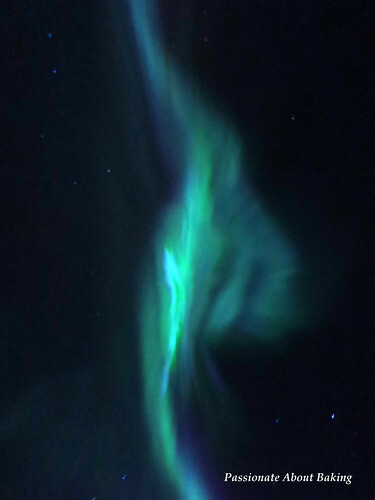 I also found that auroras that are at the horizon is only greenish and blue. Those that are high above in the sky will have red and purple as they are at higher altitude. Overall, it was still a great experience for me. I'm happy and fortunate to have seen this natural phenomenon in this lifetime. Especially when you get to captured them beautifully on the camera, you will find it all worth the journey and the cold. Source: Tromso Safari, dated 6 Mar 2016. Photos taken by their guide. We were not on this tour. 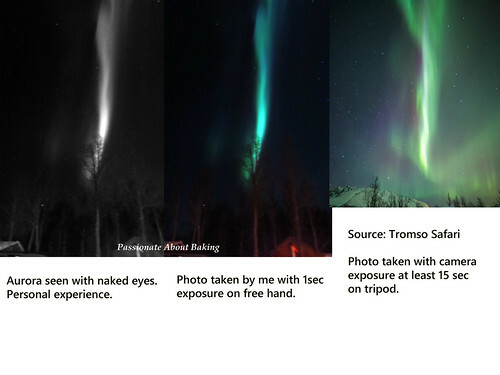 You can compare the Aurora colours based on the exposure. The longer the exposure, the more colours it captured. Refer to my photos earlier on the same date. What I captured were mostly blue and green. 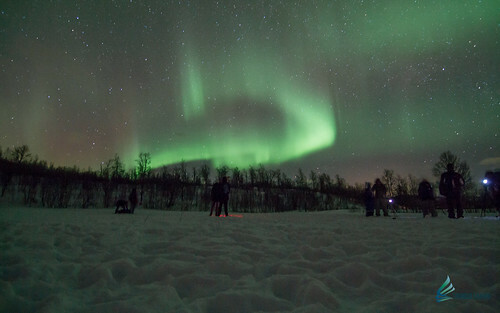 What this guide captured had different density of colours (when we saw the aurora on the same night). All the best on Aurora hunting! Nice! The lights are like dancing happily! Yes, aren't they just beautiful even without the colours?